ABASCO spill response kits comply with Coast Guard 33 CFR, Part 155, Oil Spill Regulations. These oil spill cleanup kits are constructed with heavy-duty fiberglass or heavy-duty polyethylene. They are either rectangular boxes (SRK 47) or DOT cylindrical containers (SK 95). 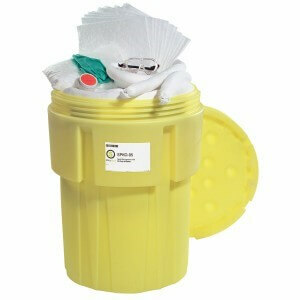 The spill response kits contain all the necessary items for a quick response to any kind of spill. The items include sorbent pads, containment boom, nonsparking shovel, nonsparking bucket, Tyvek® suits, rubber gloves, goggles, nonsparking hand pump, and other necessary tools. Oil spill cleanup kits can be customized for specific needs.